Nagasaki is among the more unique places in Japan. It is most famous worldwide for being the site of the second atomic bombing which ended World War II, but the city has a long history intertwined with Western influence that gives it a sense you won't find anywhere else. Massive churches, statues, maze-like streets running up both sides of the valley walls, and houses that seem to float in mid air from the ridges. There really is no other place like it in the country. Of course, the easiest way to see this place is through Google Maps Street View. One of the more mysterious places in the city has just been made available to see around the world and everyone, including millions of Japanese people who have never been there, now have the ability to see it for the first time. Hashima Island, or Gunkanjima "Battleship Island" as its more commonly referred, lies a good distance out into the ocean from the city. Boat tours that sail passed it reveal a ghost town full of decaying buildings overgrown with greenery. The haunted scenery provided production managers of the most recent James Bond film, Skyfall, with the inspiration to create one of the film's key locations. The antagonist, Raoul Silva portrayed by Javier Bardem, set up base on a similar island in the Pacific, and many of the film's important scenes occur there. 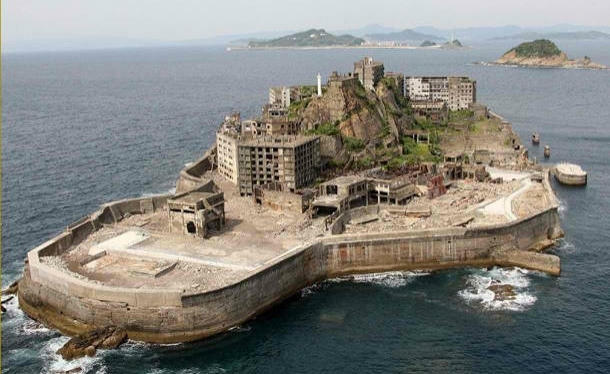 Production manager Dennis Gassner wanted to actually use Hashima Island to film the scenes taking place in the hideout, but he was not allowed because the city government could not guarantee the film crew's safety due to poor structural integrity. Instead, he took a rare tour and tried his best to recreate the island in a studio. Hashima Island was populated for many years as a coal mining town, but the residents left after the supply of coal dried up. Tours just recently opened up to the public in 2009, and Google has also been allowed to visit and create a full 360 degree panorama shots for its Streetview. Give it a quick view if you are interested in seeing one of the most unique and haunting places on Earth. Of course, visiting the city of Nagasaki is the best option as well, and the scenery there is something you will never forget.